In the end of january 2009 Moun and me was traveling from Koh Chang to Siem Reap for see Angkor Wat. The temples of Angkor are the biggest religious building in world and from Koh Chang easy to reach with the minibus. We was starting at 7 o´clock here on the Island. Our first station was Aranya Prathet in Thailand. Here we cross the border to Poipet in the Kingdom of Cambodia. The border was buisy and we need about 2 hour to come into Cambodia. Direct after the duane of Thailand are many casinos and big hotels, many people of Thailand make holiday over here for have moneyplay because on thai side it´s illegal. 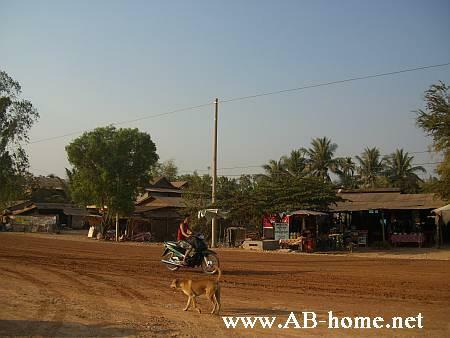 From Poipet we took a taxi to Siem Reap. The turn needs 3 hours thrue Cambodia over sand streets. Compared to other countries in southeast Asia the Kingdom Cambodia is less develloped but everywhere they build, Many projects are supported by states like south Korea or Japan. Wat AngkorIn the late afternoon we arrived our hotel “Bequest Angkor Hotel”. The room had air-con, TV, fridge and hot water for 15 USD. Here in Cambodia rule the dollar, even if you go to a ATM you get the US notes. 1 dollar are around 4000 Cambodian riel. In the morning of the next day we was going with a Tuk Tuk to Angkor Wat for watch the sunrise behind this spectacular Buddhist temple. This Wat are built for King Suryavarman 2th in the 12th century. The entry fee is 20 USD so really expensive for Cambodia but ok for this amazing wat (wat = temple). When the sun was up we gone inside to view the spectacular architectural and the old Buddha statues in the floors of Angkor Wat. After we took breakfast in a small Khmer restaurant near the temple. The next point on our day plan was Wat Byon which is a Buddhist and Hindu temple. 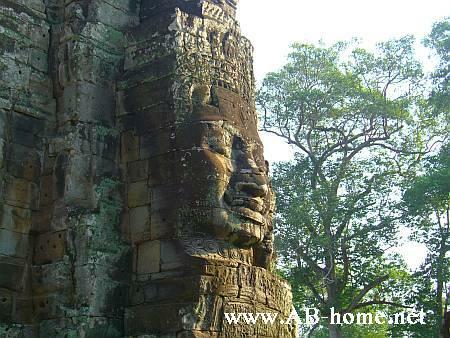 The 54 Gothic towers of Bayon temple are decorate with 216 Avalokitesshvara faces. Bayon are planed from Cambodias legendary King Jayavarman 7th. For me was the highlight the Ta Prohm temple. This atmospheric ruin at Angkor is famous from the movie Tomb Rider. 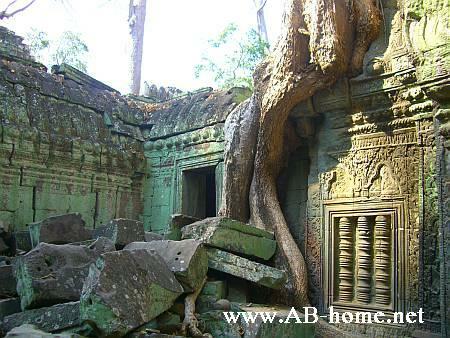 At the temple of Ta Prohm you can see the might of the jungle. 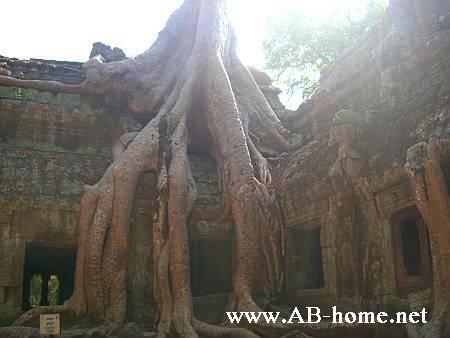 Big vast roots locked like tree muscles the walls of this beautiful monument of Siem Reap. Some years before it was danger to go around Angkor because of the landmines from the Khmer Rouge. But now it´s ok around Angkor, but still here in Cambodia many people lost a leg, a arm or the life from the weapons of Pol Pot´s clique. After 7 hours exploring the Angkor we drove back to the Bequest Angkor Hotel to taka a nap. In the afternoon we walk to a restaurant which we found in the Lonely Planet Cambodia travel guide. The “Butterfly Garden Bar” close to the “Stung Siem Reap” river are nice for a brake for a fresh fruit shake. In the tropical garden here are many butterfly’s under a net. We was sitting under a palmtree next to a pool with koi-fishes. A good place to take a deep breath in this busy city in Cambodia. 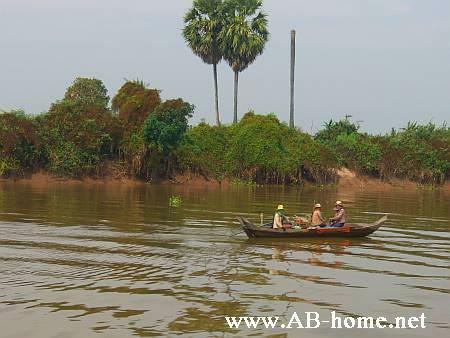 A bit south of Siem Reap are the floating village of Chong Kneas on the Tonle Sap Lake. We was visit this fisherman village on the 3rd day of our travel tour through Cambodia we took a boot from Siem Reap to the capital Phnom Penh. The boot pass the Tonlé Sap Lake into the Tonle Sap river. After this six hour bootstour through Cambodia we arrived Phnom Penh. The landscapes and the Khmers are nice. We was sitting on the boots roof and watch the people during they take in they nets. Every year the cambodian fishing about 430000 tonnes of freshwater fish out of the Mekong and the Tonle Sap. 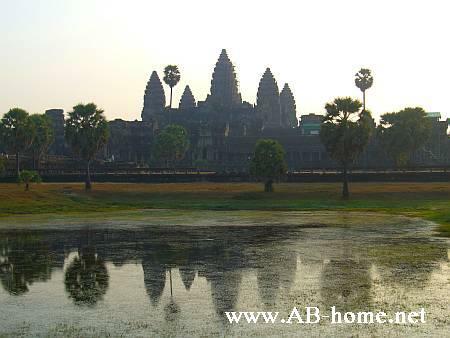 Cambodia is beautiful for travellers who want to traveling a less develloped country. My Lonely Planet travelguide was a good choice for this trip. I will come again to Cambodia to visit the sea region and the islands like Koh Kong for scuba diving. The locals invite you, with a smile, to a great country in southeast Asia! 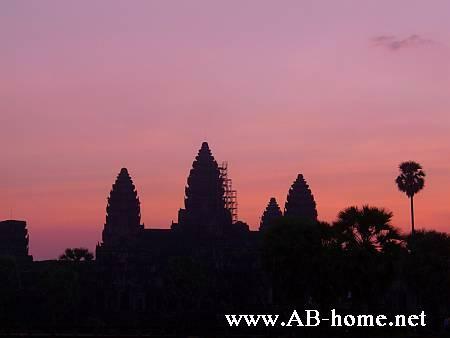 Cambodia is easy to travel, many TAT´s offer bus and boot tours to many destinations in Cambodia, Thailand and Vietnam. Angkor Wat is amaizing, i can recoment this old monument in Siem Reap to all people who are intresting in magic places and great cultures.